As seen on Conscious Living TV. Preheat oven to 350 degrees. Lightly oil a 9” spring form pan and set aside. In a food processor blend all the ingredients for Green Tea Cake. Pour into the prepared pan and bake for 25 minutes. Meanwhile pressure cook the azuki beans in 2 ½ cups filtered water. This is done by bringing all to a boil, covering with pressure cooker lid and when the hiss starts lower the. Allow to lightly hiss for 20 minutes. Turn off heat and allow pressure to come down before opening. Transfer all into a food processor and add the sea salt. Transfer into a sauce pan and add brown rice syrup and agar agar. Simmer until thickened, about 3-5 minutes. Once cake is out of oven pour the azuki mixture on top. Allow to cool 1 hour and then transfer to fridge. Let set up for 1-2 hours at least before slicing so azuki frosting can firm up. 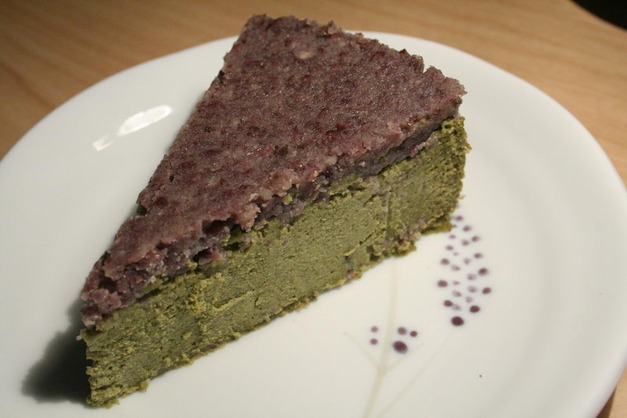 The green tea cake will have a texture similar to cheesecake and will be a little wet. Lightly sweet and a great accompaniment to tea on an early spring afternoon!